George Groves says he should be the favourite when he challenges fellow Briton Carl Froch for his WBA and IBF world titles in Manchester on Saturday. Unbeaten Groves, 25, claims he has the ability and mentality to make up for Froch's 11 years more experience. "In the emotional and mental battles I have annihilated him. I think I should be favourite," Groves told BBC Sport. Froch has lost twice in 33 bouts and dismissed Groves as "disrespectful, very arrogant and downright rude". "He has developed a whopping ego and he seems to have turned into a bit of a bad lad," Froch added. "It is uncalled for and I don't like that. I am going to take great pleasure in knocking him out." 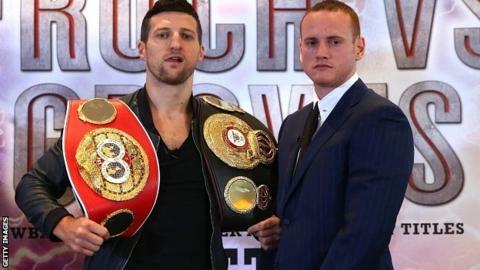 A veteran of 13 previous world titles fights, Froch aims to use the fight as a stepping stone to a rematch with American Andre Ward, who beat Edwin Rodriguez last weekend.